Sharing Our Music Collection Over the Internet. 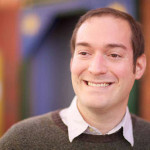 This past week I set up Crouchhouse Radio, which is a network / internet-accessible music portal for my family. Our music (ripped CDs, downloaded MP3s, bootlegged shows, original recordings) are all available on any computer, Mac or PC, on our network. In addition, by setting up a dynamic DNS subdomain on crouchhouse.com, we can stream our music from work or on our mobile devices. Why not just use iTunes or Apple Music? iTunes provides pretty easy music sharing across PC, Mac, and iOS devices. Using Family Sharing, you can supposedly make your iTunes library available on other computers on the same local network. However, when I moved our entire music collection to a single computer that I intended to leave on all the time with iTunes open and sharing, it just didn’t work that well. Client computers, both PC and Mac, often didn’t see the shared iTunes library in the shared libraries dropdown. To try and get around this, I tried sharing my iTunes library music folder as a network drive across computers and then having iTunes load this library locally. This didn’t work very well when networking between Windows and OS X computers. I suppose I could have put the music folder on Dropbox and locally read the music library on each computer, but I didn’t like the idea of putting that music media in my Dropbox and necessarily running Dropbox on each client computer. It seemed brute force instead of elegant, not to mention super clunky on a mobile device. The music files you can access over Apple Music need to exist in the global iTunes library. This means original recordings, bootlegged concerts, or crappily-tagged music files you already own will not be accessible through the interface. As a musician with lots of not-commercially-available music files from fellow musicians, this was a deal breaker. 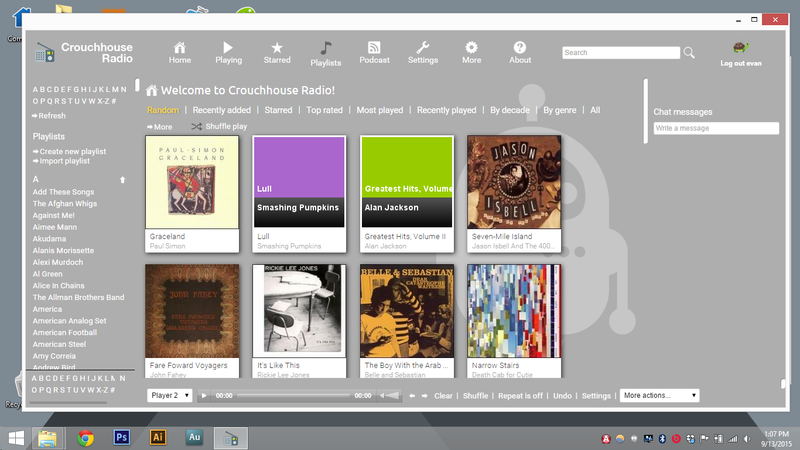 Once logged into Crouchhouse Radio, we have access to all of the music and videos shared on one of our home PCs. By default, Subsonic requires user accounts to access the media library. I liked this so randos couldn’t simply see our stuff. So what’d I do instead? 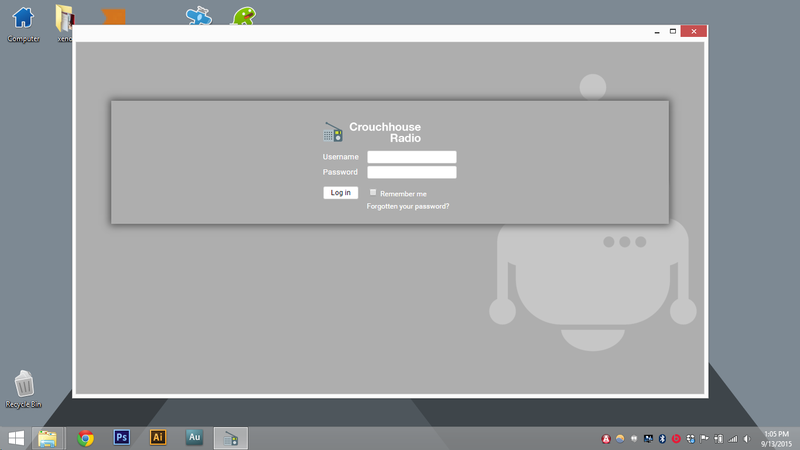 Instead of using an Apple solution, I set up Crouchhouse Radio in a few hours. It is a Subsonic media server running on one of our home PCs. With a readily-accessible web interface, all it took to customize a personalized radio for our house was to style the CSS & images (logo, background image, etc) in the interface. Once the web interface was looking like I wanted it, I created a Google Chrome Hosted Web App so that the radio could have its own desktop icon for both PC and Mac. As you can see from some of the screenshots, the chrome app lets me save Crouchhouse Radio to the launchpad on a Mac or the taskbar in Windows. So how’d I set Crouchhouse Radio up? The first step was to get all my media (music & videos) onto one computer. This seemed a little scary in case that harddrive met its end, so I set up a RAID-like HDD array using Windows’ built-in (and very cool) Storage Spaces feature. This way if one harddrive dies, the files will keep existing / being served. One the library was centralized, I installed a Subsonic server on that computer. The installer also installed Java, which Subsonic needs in order to run. Next, to keep the IP address of the media server the same, I switched that PC from having a DHCP-assigned IP to a static IP. Then, I created a few port-forwarding routes in my LAN router to allow internet traffic to reach this media server. Since I have a dynamic internet IP address, I set up a subdomain of crouchhouse.com, radio.crouchhouse.com, that forwards to this IP address. In order to do this, I created an .HTACCESS file that uses mod_rewrite to forward traffic to our Comcast IP. The IP gets updated by the Crouchhouse pinger script to stay up-to-date with dynamic IP address changes (For more on that, see the post: Introduction to Crouchhouse.). Finally, I installed the Chrome extension on the computers I wanted to have access to the radio, and set up some user accounts (the house, me, my wife, etc). 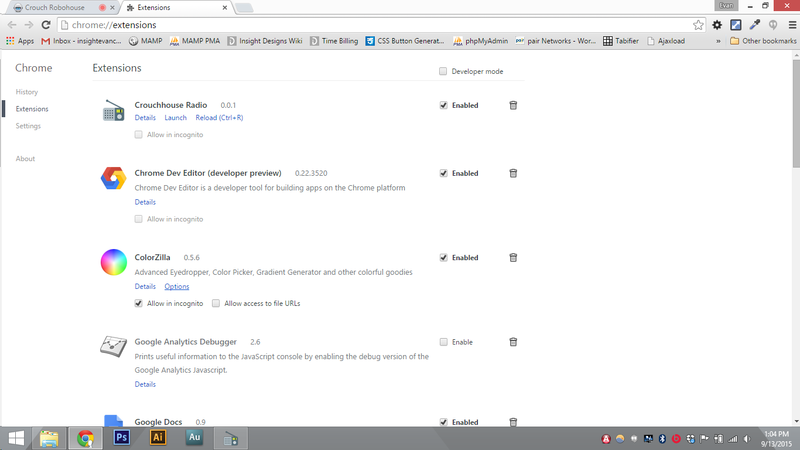 The Crouchhouse Radio extension as viewed from the Chrome Extensions settings page. Subsonic can stream most audio file types. In this screenshot you can see shared live Evan Dando recordings, which totally wouldn’t be accessible on Apple Music. The album image is broken, which seems like a bug. I’m guessing it wouldn’t be hard to have it default to a set image. You can play music on other connected devices through the web interface. So from Room A you could start/stop music in Room B without using any VNC software. 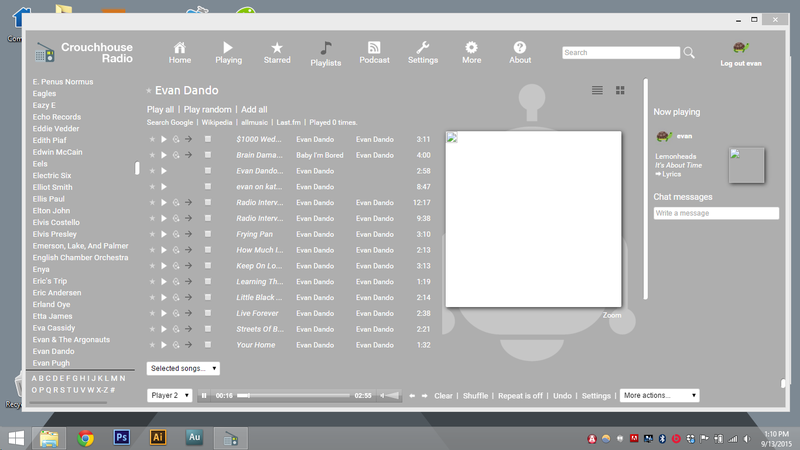 In addition to controlling other web players, I think it can also control Sonos hardware. For a few days I’ve listened to music files at work that are streaming from my home network. It’s pretty cool! I’d love to hear about your similar projects / questions below in the comments!